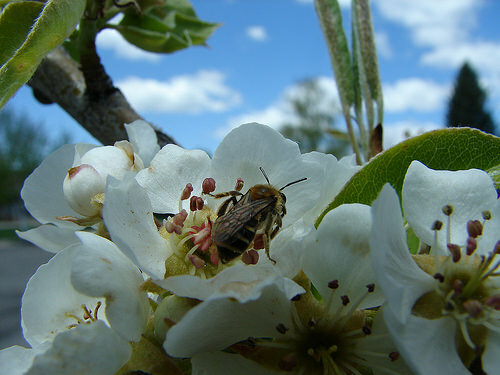 A native Andrena bee species gathers nectar and pollen from a pear flower (Jim Cane, ARS). Dogged by pests, pathogens, poor nutrition, and other problems, the European honey bee is having a rough time these days. 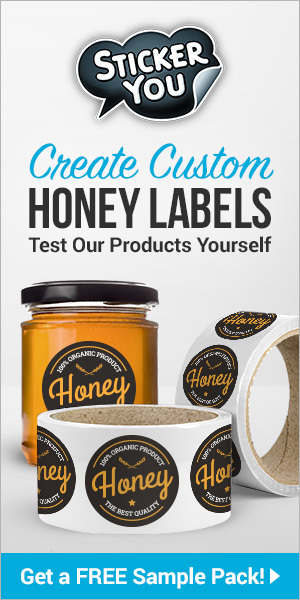 The bee pollinates over 90 different kinds of fruit, vegetable and nut crops. These same crops are also pollinated by native bees, particularly on smaller or diversified farms and especially in home gardens. Together, their pollination services are an $18 billion annual asset to U.S. agriculture, and concern over their welfare prompted the White House in May to issue a directive aimed at bolstering their numbers and health through a series of initiatives including improving and expanding pollinator habitat. Citizen involvement is another component. Among the actions citizens can take is growing nectar- and pollen-rich flowering plants; another is “customizing” garden or landscaping areas to make them more hospitable to these pollinators—especially native bees, says entomologist Jim Cane, with USDA’s Agricultural Research Service (ARS) Pollinating Insect–Biology, Management, Systematics Research Unit in Logan, Utah. In a three-year outdoor experiment conducted on the campus of Utah State University, Cane found that the common, widespread social bee species Halictus rubicundus (H. rubicundus) prefers digging its subterranean burrows next to small surface stones rather than in areas of bare soil. The next generation of queens, who mature in the fall and hibernate away from the cluster, return in the spring to use those same sites to establish nests of their own. Indeed, when Cane created a thin mulch of flat stream pebbles along the edges of a landscaped sidewalk area, he observed 66 to 78 percent more burrows there the following spring than in adjacent areas of bare soil. 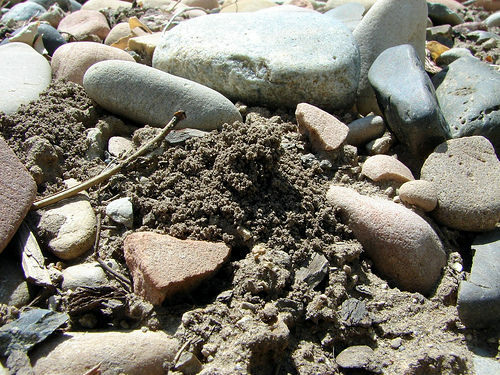 Burrow dug by female Halictus rubicundus bee amid pebbles (Jim Cane, ARS). Together with Utah State University Extension, Cane turned his research findings into practical guidelines that gardeners and landscapers can follow to create habitat areas that will serve other ground-nesting bees, which comprise about three-fourths of the 4,000 described native species in North America. “Bees have two primary needs in life: pollen and nectar to feed themselves and their offspring, and a suitable place to nest,” writes Cane in his guide, Gardening and Landscaping Practices for Nesting Native Bees. While lists of bee-friendly plants are available, most practical advice focuses on practices to avoid, like using buried landscaping fabric or sprinkler-irrigation systems during daytime, which can disrupt a female bee’s orientation to familiar landmarks. For ground-nesters, like H. rubicundus, Cane suggests creating a single surface layer of small, streambed-type pebbles along the perimeter of a flower garden or landscape area. It’s important that these pebbles remain undisturbed by foot traffic, because female bees will burrow into the ground near them and rely on the pebbles’ positions as landmarks to return to their nests after foraging for nectar and pollen. When pruning plants with woody stems that have pithy or hollow cores, Cane advises, leaving a few foot-long dead sprigs in place. This will attract species that prefer to nest above ground, like small orchard bees. Urbanization, loss of habitat, and other events have taken a toll on managed and wild bees. But they’re resilient insects, and even a few simple steps to help these important pollinators can go a long ways. “Watching them forage and nest can be great fun as well as educational for curious homeowners—they’ll quickly appreciate the truth in that old saw, ‘busy as a bee!’” says Cane. 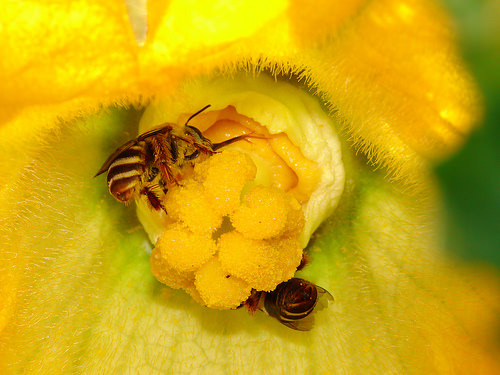 Two female Peponapis squash bees pollinating a zucchini flower. These bees are key pollinators of squashes across much of the United States.